Ding-dong! 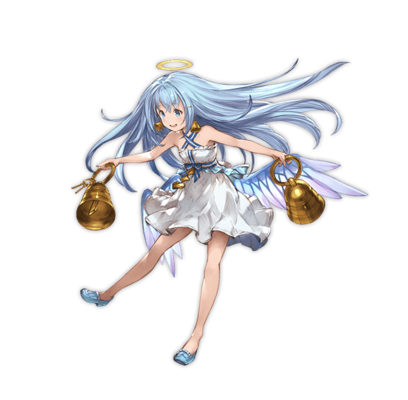 This angel raises her sonorous voice and delivers the sound of bells wherever she goes. This sound brings joy and blessings to the souls of listeners. Ward. (All allies gain WardWard. Duration: 1 turns.) 9T9 turn cooldown. Cannot be uncapped with Sunlight Stones. Only 4 copies of this summon can ever be obtained per account. for all allies that lasts for one turn. If any ally's WardWard. is unaffected by Kirari's Call. 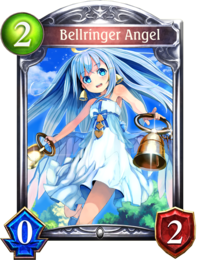 Last Words does not apply to other Bellringer Angels and non-reusable summons. Based on the Shadowverse card of the same name. Last Words is a common gameplay mechanic in Shadowverse, referring to effects that trigger when the card with it is destroyed. Ward is also a common gameplay mechanic which forces attackers to target said card first, shielding other targets from harm. Ding-dong! Hee-hee! Can you hear that? That's the sound of the bells of joy! Try closing your eyes and let it sink deep into your heart! 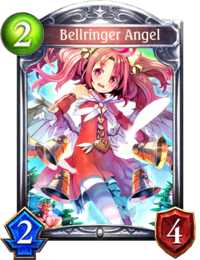 It's time to ring the bells of joy! These are no ordinary bells, you know! They play a song of love that blesses listeners' souls! This page was last modified on 3 February 2019, at 20:21.